THE FIRST ALL-INSTRUMENTAL PARAGON ALBUM IN THE TEN YEARS! Performed by the Paragon Ragtime Orchestra, Rick Benjamin conductor; featuring Tim Albright, trombone soloist; Paul Murphy, cornet soloist; Mike Dobson, drum soloist; and Rick Benjamin, piano soloist. “The Hustler” (march, 1911), by Harry Alford. “Jazorient” (fox trot, 1919), melodies by Lou Gold, arr. Harry Alford. “Some of These Days” (medley two step, 1910), Shelton Brooks, arr. Harry Alford. “Roll ‘Em Up” (drum solo, 1922), by Harry Alford. “Just A-Wearyin’ For You” (trombone solo, 1908), Carrie Jacobs-Bond, arr. Alford. “The Smiler” (rag, 1907), Percy Wenrich, original piano solo. “The Smiler Rag” (two step, 1907), Percy Wenrich, arr. Harry Alford. “Fiancée: The Bride to Be” (descriptive intermezzo, 1913), by Harry Alford. “Jazette” (one step, 1919), melodies by Harry Potter, arr. Harry Alford. “The Memphis Blues” (1912), W.C. Handy, arr. Harry Alford. “Independent Moving Picture March” “IMP” (1910), by Harry Alford. “Let Me Call You Sweetheart” (waltz, 1925), Leo Friedman, arr. Harry Alford. “The Peacemaker” (descriptive march, 1905), by Harry Alford. “Jazz Elite” (waltz, 1919), melodies by Harry Potter, arr. Harry Alford. “Spooks: A Midnight Chase” (descriptive novelty, 1914), by Harry Alford. “A Perfect Day” (cornet solo, 1910), Carrie Jacobs-Bond, arr. Harry Alford. “Memories” (ballad, 1915), Egbert Van Alstyne, original piano score. “Memories” (fox trot, 1915), Egbert Van Alstyne, arr. Harry Alford. Shapiro’s Song Successes No. 4 (medley overture, 1909), compiled & arr. by Harry Alford. “Call of the Elk: the Official B.P.O.E. March” (1920), by Harry Alford. In the 1890s, when Harry Alford formed this ambition, no such profession yet existed. His vision of a large-scale independent bureau serving publishers, producers, theatrical stars, conductors, composers, and songwriters with ingenious, instantaneous, made-to-order musical arrangements had no precedent. Yet Alford’s execution of this dream succeeded beyond anyone’s expectations, resulting in over thirty thousand scores which formed a repertoire played by virtually every American band and orchestra and heard by millions. 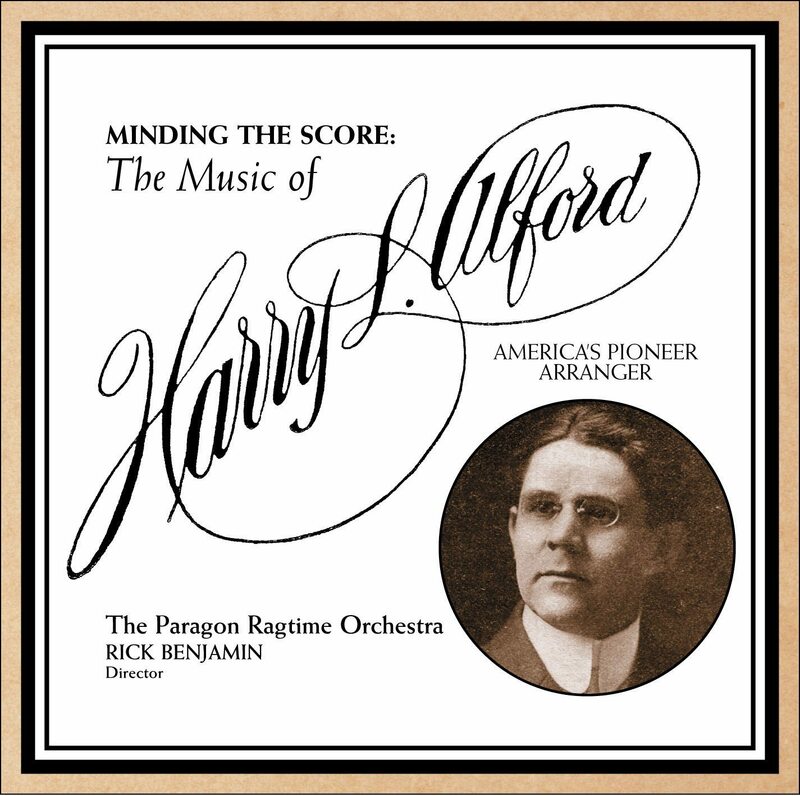 Harry Alford arrangements were commissioned by almost all of the nation’s music publishers and his songwriter and composer clients formed a virtual “who’s who” of American popular music of the early twentieth century. Dozens of the biggest pop hits of the 1900s, 1910s and ’20s were first introduced to the public as “clothed” by Harry Alford. At the same time Vaudeville was America’s leading form of entertainment, and during its “Golden Age” Alford was the composer/arranger of choice for every top vaude act. Harry L. Alford’s influence on American music was powerful, not only because of his massive output, but through his innovations. His distinctive “chromatic counterpoint,” promotion of the brass and woodwind instruments as absolute equals of the strings, and brilliantly conceived percussion writing stood America on its ear. And through his once widely celebrated achievements, “arranging” came to be a recognized and a highly respected branch of the musical arts. The eighteen selections heard on this recording were written between the years 1905 to 1925, the twenty-year period that offers the best overview of Alford’s influence and artistic legacy. Produced by multi-Grammy Award winning “Classical Producer of the Year” Judith Sherman, MINDING THE SCORE is a joyful discovery one of the true “Founding Fathers” of American pop music. "If PRO is not already labeled a national treasure it should be."